OxyCube is designed to be a compelling replacement of standard PC software from phone manufacturers, such as Nokia PC Suite, Sony Ericsson PC Suite, Samsung PC Studio, etc. The current version of OxyCube supports the following sections: Phonebook, Organizer, File Browser, Event Log and Messages. Due to this software you have a possibility to read phonebook to the PC memory, edit it, set caller groups and upload contacts back to the phone. You can also export phonebook to CSV, TXT, RTF, PDF and other popular text formats and print it directly from the program. Organizer allows a handy management of your business schedule. You can create the following types of events: Meeting, Call, Memo, Anniversary etc. You can also view events for the current or the next day. You can customize displaying of events for the exact day, workweek, week or month. Besides you have a possibility to export your events to popular text formats. File Browser section reads full information from all drives of your phone, downloads images, melodies, video, documents, applications, saves them to PC and writes them back to the phone. Event Log section allows to view and work with calls, messages, and packet data lists. You can also export this section data to the most popular formats. Messages section shows all SMS and E-mail messages stored in your phone in the Outlook-like interface. It permits you to read Inbox, Outbox, Drafts, Sent, My folders and Mailbox folders content. You can create and delete custom message folders, clear messages from your phone and move them between folders. You are able to create and send both plain and Unicode SMS messages of any length in the program and print or export messages to the most popular text formats. You can see only the necessary messages with a quick filter that makes your SMS management more comfortable. 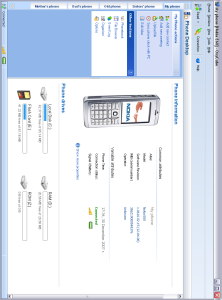 This version supports over 500 Nokia phones and smartphones as well as Sony Ericsson smartphones and other Symbian based devices. The list of supported models is constantly growing. To get the latest OxyCube version supporting your mobile phone please visit http://www.oxygensoftware.com/en/. OxyCube supports USB cable, Bluetooth (Microsoft, Widcomm, BlueSoleil) and infrared connection using IrDA stack. The software works under Windows Vista, Windows XP, Windows Server 2003 and Windows 2000.